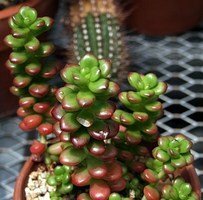 I struggle with most Sedums, which is odd as they are supposed to be such easy plants... but most are not that easy in my very warm and arid climate. 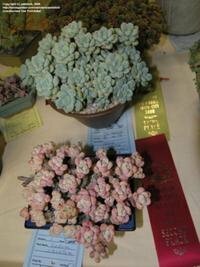 However, there are some good Sedums for my area. This article will introduce you to a few of those. 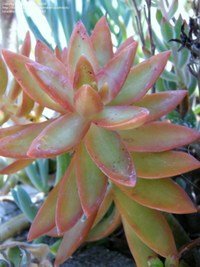 When most people think of succulents, they think of plants that like a hot and arid climate. 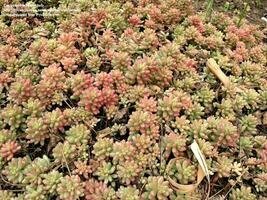 Indeed, most sedums are succulents, and most are also quite drought-tolerant. 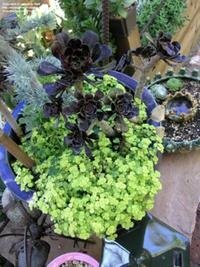 But surprisingly (at least it was a bit of a surprise and a disappointment to me) many sedums don't like my arid Mediterranean climate here in Southern California, though it's taken me years of thick-headed purchases and experiments involving much loss of life (sedum life, that is) to discover this. 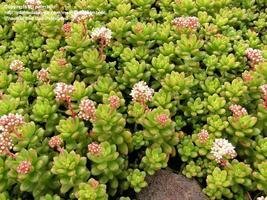 Many sedums are quite cold-tolerant and can be grown in many more climates than most of the succulents I am used to growing. 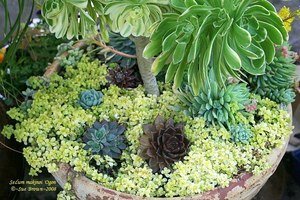 Nearly every website on sedums claim they are some of the easiest and most carefree plants to grow in both the garden and in pots. Then why can't I grow them? Well, it turns out I can...if I select the right species. 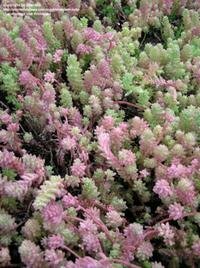 The common name for Sedum is "stonecrop," although I don't know if every Sedum species carries this moniker. 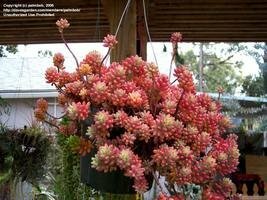 I remember growing up seeing sedums in our family garden in New Mexico, at over 7000 feet elevation. 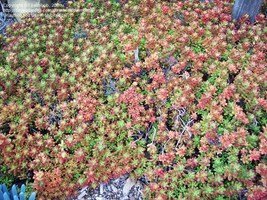 That should have been my first clue that not all Sedums might like my current sea level climate where it gets over 100F frequently and rarely much below freezing. 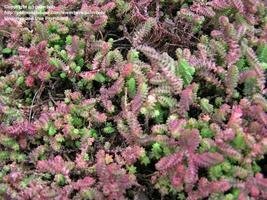 The Sedum Society is located in England... that's another clue. 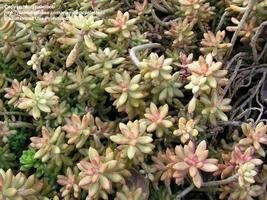 Sedums are related to other plants that I can quite easily, for the most part, in Southern California. 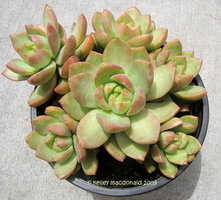 For example, Echeverias, Aeoniums, Dudleyas, Kalanchoes and Crassulas are all members of the same family, and though not all are easy to grow, for the most part, I can manage the majority of them. 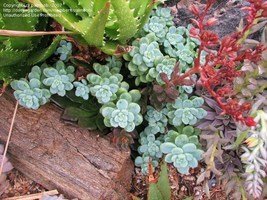 But Sempervivums (aka Hens and Chicks) are another example of a Crassulaceae succulent that I struggle with, with the huge majority being ones I cannot seem to keep alive over the summer, not keep happy over a winter. 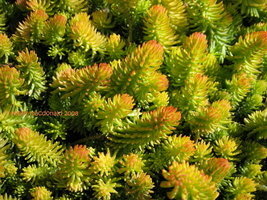 Sedum is a large, diverse genus- there are well over 100 species of Sedum. I figure I can grow about 10 or so. 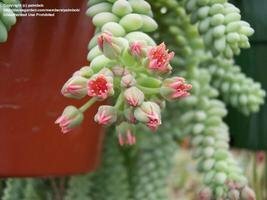 Sedums all have similar flowers, at least in their basic makeup, with most being white or yellow. Some come in a variety of other nice colors, though. 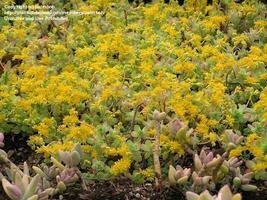 For most species of Sedum the flower is the least spectacular part of the plant. 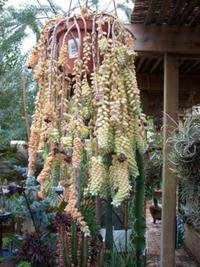 However, there are some grown specifically for their showy flowers (most of those species are examples of ones I cannot seem to keep alive). 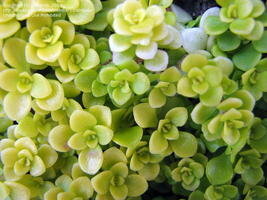 The following are some of the Sedum species that I can grow well. This does not mean a wiley gardener (which I am not) cannot grow many other species, but that such a gardener may find some species a bit less happy in our climate than perhaps in Ohio, New York or Montana. 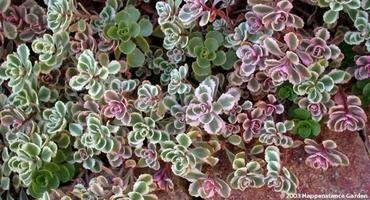 This is far from an exclusive list of Sedums that can grow in Southern California, but these are some of the more common ones that seem to actually like it here. 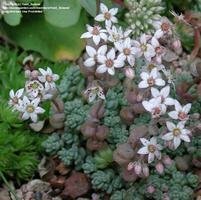 Sedum album also called White Stonecrop (due to its dense show of white flowers in summer and fall) is actually a borderline species for me, but if kept dry and shaded in summer, it does pretty well. 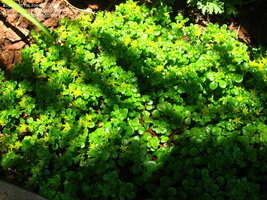 This is one of the ‘ground cover' species and barely grows over a few inches tall. 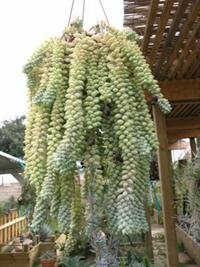 I have not had much personal success with this one, but it is growing very well at the Huntington Gardens in a climate similar, but a tad less hostile than mine. This plant originates from Western Europe and has some impressive cold tolerance (down to zone 3) as well as a modicum of heat tolerance. 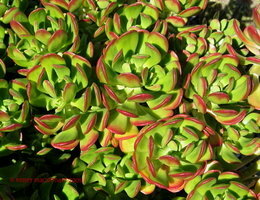 Sedum clavatum is one of my favorite of all the Sedums that grow in my garden. 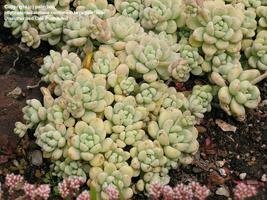 Maybe it's because it doesn't look like a Sedum, but more like a small, fat-leaved suckering Echeveria. 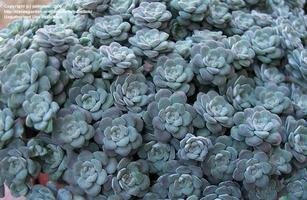 Its thick, succulent blue-grey leaves form very Echeveria-like rosettes, and it seems completely happy in frying, hot summer sun, though it does look better in winters. 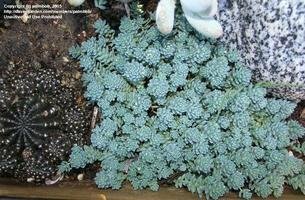 Sedum dasyphyllum aka Corsican Stonecrop is probably the only true miniature-leaved sedum that I can grow--and I still struggle with it. 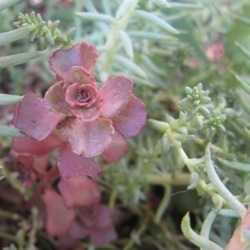 But it's worth trying as it is a gorgeous groundcover or trailing species with deep blue-grey leaves. 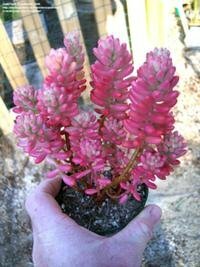 I live just beyond its listed hardiness range (borderline 10a, when it's only supposed to make it up to 9b) but for some reason this one is much easier than all the other Sedums that supposedly grow well in zone 9b. It, too, looks best in winters here, and I have yet to see one flower in my climate. 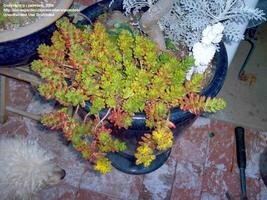 Sedum dendroideum is known as the Tree or Shrub Sedum or Stonecrop and it looks a bit more like an Aeonium to me. 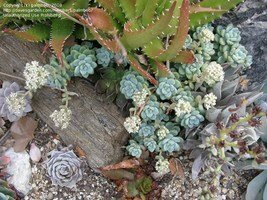 I have not grown this one, but it looks happy as can be at the Huntington Botanical Gardens, which is in my climate area. 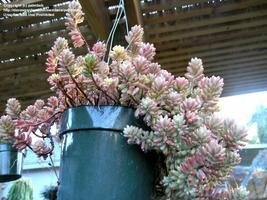 However, photos of this plant in northern California show it to be even happier up there in that cooler situation. 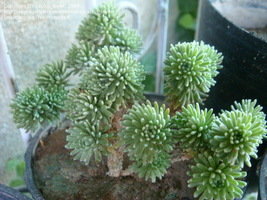 There are several subspecies of this plant, but I don't really know how they differ. 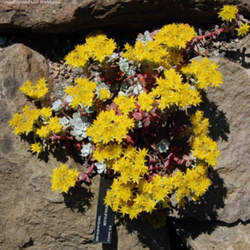 Flowers are a bright yellow in winter. 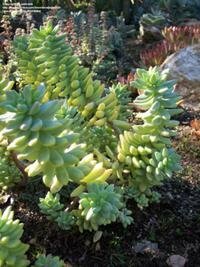 Sedum lucidum is a species I grow, but it is pretty sluggish for me, growing reluctantly in summers in full to partial sun. 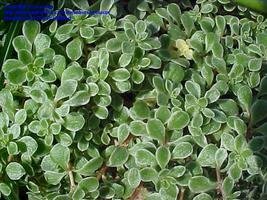 It is a small, fat, shiny-leaved plant with white flowers in winter. 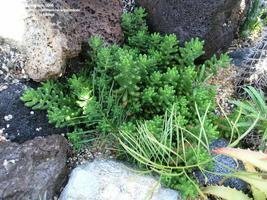 I wouldn't say it thrives here, but I have it growing in the garden and pots, so it can't be too hard to grow in this climate. 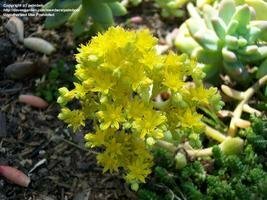 Sedum makinoi is not one of the easier species for me, thanks to blazing hot summers, but it does tend to linger on in the shadier parts of the yard. This dinky-leaved plant comes in a variety of cultivars from pale yellow ('Ogon'), to lime green ('Limelight') and variegated. I presume there is a type version, perhaps deep green, but I have not seen it. My favorite of these is 'Ogon' and that is the one I have had the most experience with. 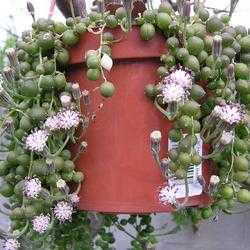 Grown in winter and spring this plant makes a great pot ground cover, or a delicate actual groundcover. 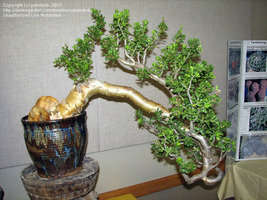 It seems to need to be watered regularly, though it doesn't die quickly if let to dry out. But all day long hot sun definitely is not its friend (though it is listed as a full sun plant in the Plantfiles). 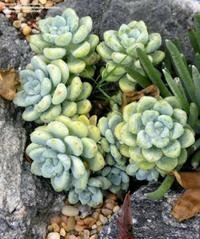 I lose most of my clumps either due to poor location (too much hot sun) or from underwatering. 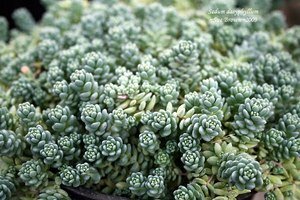 Sedum morganianum (aka 'Burrito' or Burro's Tail) This well known trailing plant is one of the best Sedum growers in a warm and dry climate. Though it does not relish hot, summer sun in my climate, it does well in the heat if given some sun protection and not let completely dry out (then all the leaves tend to fall off). 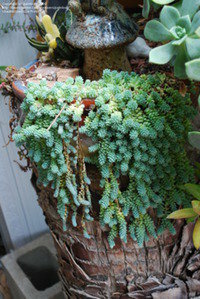 Though I am still unclear if Sedum 'Burrito' is the same plant, I think it probably is and it sure grows about the same. 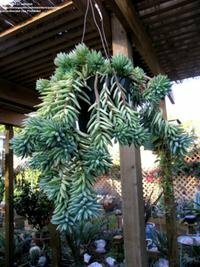 A hybrid of this species, Sedeveria 'Harry Butterfield' is probably even a better and more ornamental plant and certainly does well in my yard. 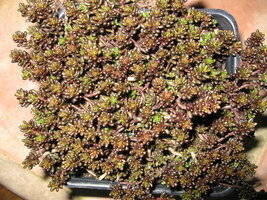 Sedum nussbaumerianum or Coppertone Stonecrop For full-sun foliar color, I think this is the best Sedum species there is, at least in my climate. In shade this plant gets stretched and unhappy, as well as grows a deep to lime green. 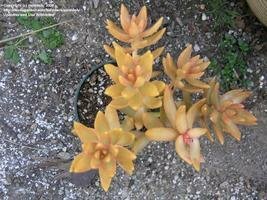 But in full sun this plant turns yellow to a deep yellow-orange that is hard to beat in terms of leaf color. 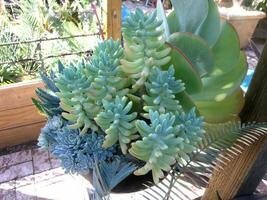 I have no other succulents that attain this color. 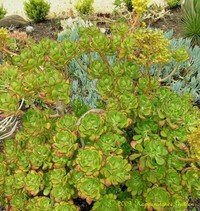 It is extremely drought-tolerant, but it also is water-tolerant (which is good for my careless style of watering) and I have yet to rot any by overwatering. 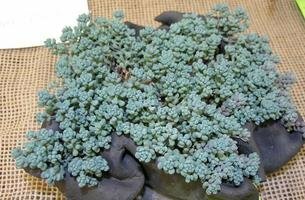 Of all the Sedums, this has to be one of the top two easiest for me to grow. Flowers are less than spectacular being dinky and white in summers. This is a Mexican species. 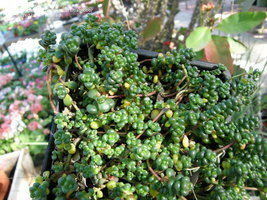 Sedum pachyphyllum or Jelly Bean Plant is another super easy plant for me in my yard. 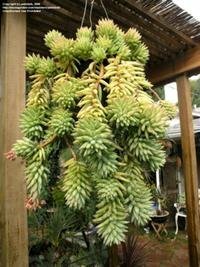 This plant looks a bit like a giant form of Sedum rubrotinctum with bean to banana-shaped small, turgid leaves. 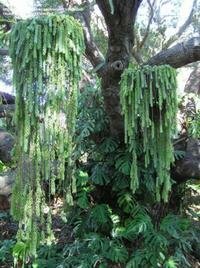 In shade these grow a pale blue-green but in sun they sometimes develop a tip of red or pink. 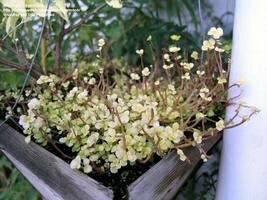 It is a groundcover species that also grows well in pots. Eventually it gets leggy and has to be cut back. Flowers are yellow in summer. Sedum x rubrotinctum, aka Pork and Beans, is, next to Sedum nussbaumerianum, probably the easiest Sedum to grow for me... and its tenacity in the garden approaches weed status. 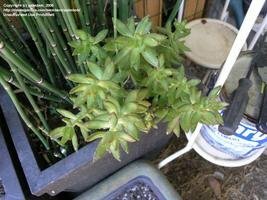 This plant has fallen out of pots and planters and continued to grow where it fell. Now I have it growing here and there throughout the garden. It is a ovoid, shiny-leaved plant with wonderfully colored leaves- deep green to deep red (depending on how much sun or cold it gets). 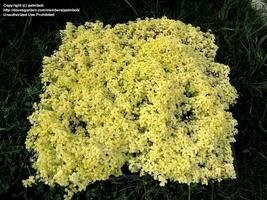 The variety 'Aurora' has pale yellow to pale green with some nice pink, also depending on sun and cold. 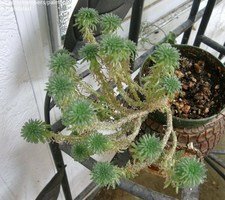 I have grown this species as a potted plant, but it quickly gets leggy and less attractive, so I pretty much let it do what it wants in the ground. 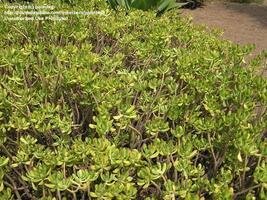 It can make a great ground cover, but still it needs a lot of trimming back yearly. I never go out of my way to water this plant, but on the other hand, I have never overwatered it, that I can tell. 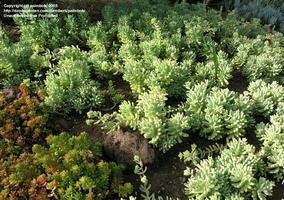 Sedum treleasei or Silver Sedum looks a bit like a ground-dwelling, upright form of Sedum morganianum, or a flatter-leaved form of Sedum pachyphyllum. 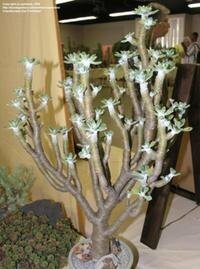 The coloration of the leaves is pale blue-green with a bit of a powdery bloom in them. Flowers are yellow in late winter to early spring. 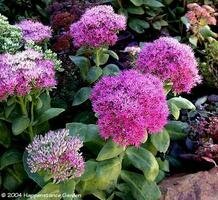 It is quite hardy in my climate, but is not a good plant for other colder climates. 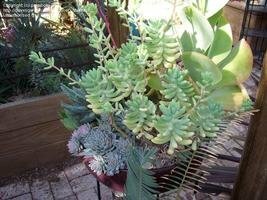 Below are a few more that grow well in Southern California but I know little about. 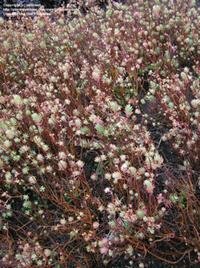 I am sure there are lots more species that can grow here in California or in inland desert climates, but these are the ones I am aware of, and there are some nice choices here to start with.